With funding obtained from the NSF Office of Polar Progams, a permanent GPS base station was installed at Summit Camp in 2006 and is equipped with real-time kinematic (RTK) surveying capability. 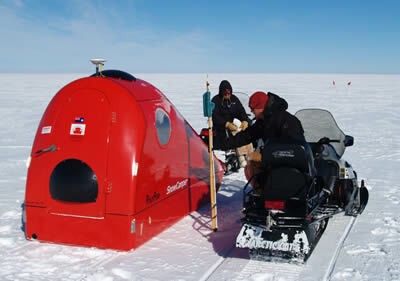 Summit Camp is a research station located at the highest point of the Greenland ice sheet, and supports a variety of multinational research, including atmospheric and snow chemistry studies, and deep ice core drilling operations. This station serves the growing scientific and operational requirements of the research and logistics communities. In addition to providing precision mapping and topographic surveying capability, the system also allows measurement of ice motion and yields data for atmospheric studies. UNAVCO personnel visited Summit Camp to perform system maintenance and inventory, update documentation, and provide on-site training of station Science Technicians. While on-site, UNAVCO also assisted station personnel with the monthly ICESat survey and revised the survey procedure protocols. Figure 1 - Summit Science Technicians Andy Clarke and Steve Munsell perform manual accumulation and GPS elevation measurements at a snow stake along the ICESat transect near Summit Camp.